Washington, D.C. – December 30, 2015 – Neighborhood Development Company (NDC) is excited to announce the acquisition and closing of construction financing for 2620 Bowen Road in Southeast DC. Funding will go towards the ground-up construction of a $13.5 million, 3-story work force rental project. Today, the property is a vacant lot in the historic Anacostia community, one block from the Anacostia metro. 2620 Bowen Road will be a 41-unit rental project, and Neighborhood Development Company’s first affordable housing project in Southeast DC. The building is over 48,000 square feet and will include a parking garage, a courtyard, community room, and bike racks for residents. Units will range from one to three bedroom with sizes from 600 to 1,000 square feet. This project is priced for residents earning 45%-60% of area median income, a substantially-underserved cohort in Southeast DC. “Giving residents with diverse incomes a chance to have a high-quality, well-designed living environment is critical to our vision at NDC. Introducing our first project in the Historic Anacostia neighborhood, a neighborhood where I grew up, adds an extra level of excitement,” said Adrian Washington, CEO & Founder, Neighborhood Development Company. 4100 Georgia Avenue NW and 3232 Georgia Avenue NW are both successful, mixed-use affordable housing projects that NDC has constructed from the ground-up. As a real estate developer, Neighborhood Development Company is known for its revitalization of the Georgia Avenue corridor. 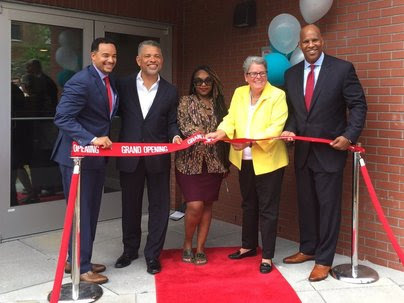 “With the close of the acquisition and financing, NDC is taking a huge step in our next chapter of growth, and growth of the Historic Anacostia community,” said Juan Powell, COO & Principal, Neighborhood Development Company. Debt funding for this project is sourced through Citi Community Capital and The DC Department of Housing and Community Development (DHCD). Equity funding is being provided by Boston Financial Investment Management, with tax exempt bond funding from the DC Housing Finance Agency (DCHFA). The architect for the project is EDG Architects LLC. Hamel Builders will serve as the general contractor for construction. The project is expected to break ground for construction in March 2016.